For as long as anyone can remember, Team USA has been the dominant force in World Swimming. Australia had a crack at that title at the Sydney Olympics in 2000, but even the mighty Telstra Dolphins were found wanting by the end of the meet. It's often said that the fastest swim meet on Earth is the US Olympic Trials. The depth of USA Swimming is so vast that it's often more difficult to make a US Olympic team than it is to win a medal at the Games itself. They also have a college sport system that is the envy of the World (or if it isn't, it should be) that acts as a breeding ground for future Olympians. We're fortunate at Dartes to have a local masters swimmer with first hand experience of US Collegiate Swimming. This weekend Dave Holmes (Arm) travelled over to the Manchester Aquatics Centre to experience Dual Meet excitement all over again. A weekly occurence during his time swimming for Binghamton University in the states, this weekend he would be one of the many enthusiastic swimming fans (instead of competitor) watching the first inter-continental dual meet to be held in the UK (we suspect anywhere). Every couple of years since 2003 the USA has picked its top swimmers and taken part in an inter-country dual meet. It's a very American concept and was organised by USA Swimming to build on the rivalry between the World's Swimming heavy weights: Australia and USA. In 2003 and 2005 they hosted the meet, in 2007 it took place in Sydney. Each time Team USA won by a large margin. 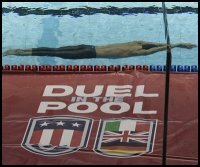 Then earlier this year Australia expanded the Duel in the Pool concept by hosting Japan at the Australian Institute of Sport. Australia narrowly won. The USA meanwhile decided they'd try something different too. They thought they could beat a combined team from Germany, Italy, and Great Britain - a European Select; the Ryder Cup of swimming. Maybe as preparation for London 2012, British Swimming were to play host with Manchester the venue. Rumour has it that next year might see a Great Britain versus Germany Duel in the Pool. A future for televised international swimming perhaps? Exciting times! So the stage was set for Duel in the Pool 2009, just up the M62 in Manchester. The Duel meet format is similar to the league galas that you all swim with your feeder clubs, just the scoring is a little different. This format is used throughout USA Swimming in club, high school and college swimming. Usually a team will swim 10 or 11 meets like this in each 6 month season before they focus on the big summer open meets. When I heard that the Duel was coming to Manchester I bought a ticket and looked forward to seeing a very exciting and interesting meet, and they didn't dissapoint. I'm sure most of you will have watched the swimming on the TV (if not then it is on the BBC iPlayer) so I won't talk too much about the world records, fast times and stuff that you saw for yourself. What I'm going to write about is the stuff that you may not have seen or heard. The first thing would have to be DARTES swimmers getting talked about before I'd even got in the building. Apparently the 14 year old boys team is quite well known! Fancy that, you turn up to an event like this and find the people queuing in front of you are talking about your own team. As for the professionals on show at the meet, they were just that -- professionals. The way they went about their warm-ups, stretching, cool downs and all the tiny things was the most impressive. I have a strong feeling that the swimmers from Team USA were briefed by their coaching staff to only give one sentence answers in interviews with Sharron Davis after they had swum so they could go and warm down right away. You could also tell that the whole USA team just knew how to get up and race, then forget about it and get ready for the next race -- very important when you've got 20 minutes or less between swims. On the topic of psychology, did anybody notice how many times British swimmers mentioned heavy training in post race interviews? I'm not saying they were making excuses, but did they think Team USA rested for this meet? I don't think so. Did you hear one American mention heavy training or jet lag? They only landed in the UK on Wednesday and should have all been suffering from the flight. The point is that the US team ignored the negatives. They did the job that needed doing and went home winners. James Goddard takes on the Americans. Short Course is all about those turns. The last important thing: these swimmers weren't doing anything massively different to what you all do technique wise. Coach Wallace and I were still able to text back and forth about how horrible some swimmers' strokes were. I guess the things that set those athletes and us apart is the amount of focus and effort that they put into training and the amount of pain they are willing to subject themselves to every day, slogging up and down the pool or in the gym. It's rarely some innate talent, it's never fancy training facilities, it's normally sheer hard work that earns the rewards.